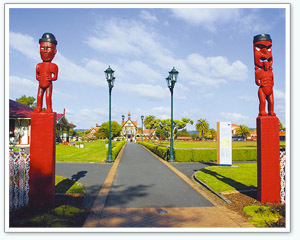 Rotorua is at a ground elevation of 380 metres from sea level. The central streets are arranged in an orderly grid and are compact, which allows for easy navigation on foot. The surrounding areas consist of forests, lakes, and volcanic zones with geothermal activity throughout. Hangi feasts are hosted by the Maoris who are well known for their culture. Kaituna River White Water Rafting, horse riding, horse trekking, jet boating, fishing tours, trekking, dirt bike tours, clay pigeon shooting, golf, you can experience the various activities. Te Puia, Whakarewarewa Village, Sky Gondola, Rainbow Springs, Kiwi counter, Aqua Dome, Government Gardens, museums and other volcanic Waiotapu geothermal.